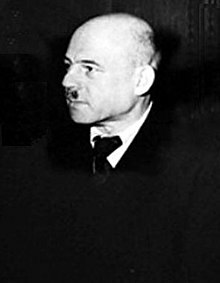 Fritz Sauckel (October 27, 1894 – October 16, 1946) was a Nazi war criminal, who organized the systematic enslavement of millions of men and boys from lands occupied by Nazi Germany. He was General Plenipotentiary for the Employment of Labour from 1942 until the end of the war. He was a defendant at the Nuremberg trials accused of conspiracy to commit crimes against peace; planning, initiating and waging wars of aggression; war crimes and crimes against humanity. He was found guilty of war crimes and crimes against humanity, and together with a number of colleagues, he was hanged on October 16, 1946. Slaves who are underfed, diseased, resentful, despairing, and filled with hate will never yield that maximum of output which they might achieve under normal conditions. March 14, 1943 speech to Gauleiters. Quoted in "The Trial of the Germans" - Page 513 - by Eugene Davidson - History - 1997. Quoted in "Trial of the Major War Criminals Before the International Military Tribunal" - Nuremberg, Germany - 1948. I'm a sailor, not a politician. Quoted in "Pattern of Circles: An Ambassador's Story" - Page 183 - by John E. Dolibois - Biography & Autobiography - 2001. 1942. Quoted in "Inside the Third Reich: Memoirs" - Page 221 - by Albert Speer - 1970. To Leon Goldensohn, February 9, 1946, from "The Nuremberg Interviews" by Leon Goldensohn, Robert Gellately - History - 2004 - Page 209. Himmler, Bormann, and Goebbels, they were probably bad fellows. To Leon Goldensohn, February 9, 1946, from "The Nuremberg Interviews" by Leon Goldensohn, Robert Gellately - History - 2004. I had nothing to do with concentration camps - Himmler's work. There was a labor minister, Ley, whose position is like your John Lewis in America. My duties were to assign POW and foreign labor to factories or whatever work had to be done. I had nothing to do with punishment, criminals, and so forth. That's Himmler's work. If someone had told me as a seaman I should have engaged in politics I would have taken it as an insult. After my return from France, when I found the workers in the Schweinfurt factory all divided up into groups, many parties - I want to give you an honest reason - that's why I became a National Socialist. In 1922-23 I knew, by fate, I must find a solution to the labor and social problem. Only Communists and Social Democrats who acted against the state were incarcerated. Most of the Communists and Social Democrats I had known became Nazis later. Only those who were doing anything against the state were thrown in concentration camps. I never burned down synagogues. It was a revolution, and Russians burned churches during their revolution. If there are many different nationalities in a country, the leadership should be divided among people by percentages. In finance, press, radio - the Jews had taken over positions. That feeling existed before Hitler. You must understand that the meaning of the word 'unemployed' in Germany is different than in America. In America, 'unemployed' means that a man may be unable to obtain work in his profession. In Germany it means he can't get work in any profession. In Thuringia there were 1.7 million people, of whom 500,000 men were unemployed in 1932 before Hitler came to power. In the whole of Germany, there were 8 million unemployed and 7 million half-time workers. America is so big that it cries for work. In Germany, if you tried to find work, you couldn't. In America, it was a strange economy which caused unemployment. German unemployment was due to the boycott of German goods. Not an official boycott. The world market refused to accept German goods. France, England, and America refused. Germany had no colonies and she had to export manufactured goods for grain. We had nothing to speak of. We managed to live during the war by rations. We all lived on a strict ration - even ministers in the government like myself - and we lived on things from the conquered countries, including Africa and Russia. That man who is responsible for slave labor in Germany does not have my sympathy. I did not like the whole idea of what he did. After all, there are limits to what one can do with foreign populations in the forced labor business. In the first place, the whole idea is completely unproductive. One needs three or four men to watch one compulsory worker. Sauckel deserves the severest punishment. Paul O. Schmidt to Leon Goldensohn, March 13, 1946. ...a plenipotentiary for the war economy who secretly marshaled the entire economy for armament, but had no idea it had anything to do with war. The defendant Sauckel, Plenipotentiary General for the Utilization of Labor, is authority for the statement that "out of 5,000,000 foreign workers who arrived in Germany, not even 200,000 came voluntarily." It was officially reported to defendant Rosenberg that in his territory "recruiting methods were used which probably have their origin in the blackest period of the slave trade." Sauckel himself reported that male and female agents went hunting for men, got them drunk, and "shanghaied" them to Germany. These captives were shipped in trains without heat, food, or sanitary facilities. The dead were thrown out at stations, and the newborn were thrown out the windows of moving trains. Sauckel ordered that "all the men must be fed, sheltered, and treated in such a way as to exploit them to the highest possible extent at the lowest conceivable degree of expenditure."